Arteries carry oxygenated blood away from the heart, these are the thick-walled muscular tube, while Veins carry deoxygenated blood towards the heart. Though both have the exception of the pulmonary artery and vein, as here the system get opposite and the pulmonary artery carries the deoxygenated blood, and pulmonary vein carries oxygenated blood. Among the two types of circulatory system – Open circulation and Closed circulation. In vertebrates, closed type of circulatory system is found, which consists of the set of tubes and blood vessels by which the blood flows and pump, and the heart which is responsible for this flow. In the heart of mammals, two types of system or circuits are found in the blood circulation; these are systemic circulation and pulmonary circulation. These two systems emerge and terminate in the heart only. The heart is divided longitudinally into two halves for its function. The blood is pumped through one system, which is the right half of the heart – the pulmonary system. The blood is pumped out through the left half of the heart – the systemic system. The blood from the systemic circulation passes to all parts of the body (except lungs) and then return to the right half of the heart. Now in both the system, the blood vessels which carry blood away from the heart are called arteries, while the blood vessels which transport blood from the lungs and tissues back to the heart are called veins. Transportation of materials between the tissues and organs is necessary to perform all vital functions of the body. The oxygen must reach each cell, and the carbon dioxide should be carried away, the same is with the nutrients and the hormones which should be distributed equally. The main role is played by the circulatory system in all these transportation. The upcoming points of this article are focused on the functions and role of arteries and veins which distinguish them from each other. Role The artery carries oxygenated blood away from the heart. Veins carry deoxygenated blood towards the heart. Colour Red in colour, as they carry oxygenated blood. Blue in colour, as they carry deoxygenated blood. 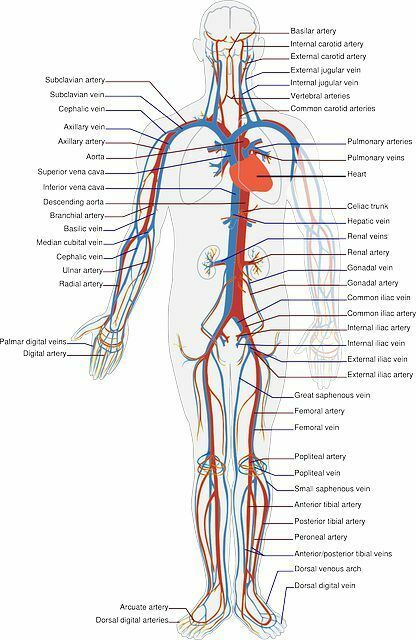 Location Arteries located deep within the body. Veins are present close to the skin, in the body. Kind of blood Oxygenated blood, except pulmonary artery. As pulmonary artery carries deoxygenated blood. Deoxygenated blood except for pulmonary veins. As pulmonary veins carry oxygenated blood. Lumen Narrow lumen. Broad lumen. Wall Thick walled, which is more elastic. Thin walled and are less elastic. Tunica Externa tunica is less strong and less developed. Here externa tunica is more strong and more developed. Media tunica is more muscular and thick. Media tunica are less muscular and relatively thin. Types Pulmonary and Systemic artery. Superficial veins, deep veins, pulmonary veins and systemic veins. Muscles tissues layer Thick layer that supports the high pressure of blood. It has the thin layer. Blood volume Low, which is around 30%. High, which is around 65%. Pulse Detectable in the artery. Undetectable in veins. Valves No valves. Valves present. Disease The main disease affecting the arteries is Atherosclerosis. The main disease affecting the veins is Deep vein thrombosis. Side effect If the blood flow stops, it will collapse. As it has the thick muscular layer, it would remain open even if the flow of blood stopped. Artery (plural form – arteries), in human physiology, is the kind of blood vessels that deliver oxygenated blood and other nutrients from the heart to the tissues of the body. The artery is the muscular tube, in soft tissues, consisting of three layers. These three layers are the intima, the media and the adventitia. These soft tissues transport blood under the high pressure exerted by the heart, during its pumping action. Intima or Tunica Intima is the innermost layer of the wall of an artery and is in direct contact with the flowing blood. The Media or Tunica Media is the middle layer and consist of the elastic fibres and the smooth muscles. The Adventitia or Tunica Adventitia consists of the elastic fibres, collagen and the connective tissue. This is the outermost covering of the arteries. 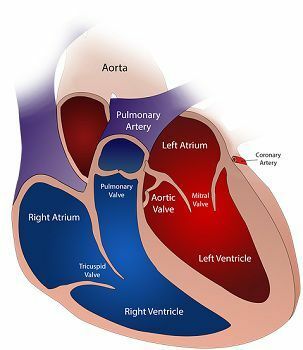 The artery which arises from the left ventricle of the heart is considered as the largest artery and is known as an aorta. This structure (aorta) has many small branches called as smaller arteries. Further, the arteries get divides into many more sub-branches called as arterioles. The further sub-branches of the arterioles are called as capillaries. The arteries and the arterioles contain the more smoothe muscles in order to regulate the changing pressure during blood flow. This pressure is the result of the pumping of the heart. This pumping is in two-phase – the diastolic phase and the systolic phase. When the heart is in the rest period, it is said the diastolic phase. Here the blood pressure is low. But in the systolic phase, there is a contraction of the heart which results in the increase in the pressure and forcing the blood to the arteries. This fluctuation of pressure is felt at the time of checking the pulse rate. The exception is the pulmonary artery, which carries deoxygenated blood to the lungs to get oxygenated and making out the excess of the carbon dioxide. When the oxygen present is blood is used by all the organs and tissues of the body to perform their function, and in return, they give waste products and carbon dioxide back to the blood. This waste product and the deoxygenated blood is carried by the veins to the heart from the tissues and organs. So their functions are opposite to that of the arteries. This deoxygenated blood after travelling to the heart is sent to the lungs, here the oxygen is replaced by the carbon dioxide and is again taken back to the tissues and organs of all parts of the body through the arteries. Depending on the location and function, veins are also of different sizes. The largest vein is found in the centre of the body, which is connected with all the small veins of the body. This largest vein is the collection centre, for all the deoxygenated blood carried by the smaller veins. The superficial veins are the veins closer to the skin surface. The deep veins are found in the closer and deeper to the centre of the body. The perforating veins connect the superficial veins with the deep veins. Like the arteries, the veins also has three layers – Tunica Intima, Tunica Media and Tunica Adventitia. The Tunica Intima is the innermost layer, made up of the soft tissues and muscles. These are in direct contact with the flowing blood. Tunica Media is the middle layer, it is the thinner layer and made up of elastic fibres and smooth muscles. Tunica Adventitia is the stronger outer covering, consisting collagen, elastic fibres and connective tissues. The exception is here also, which is pulmonary vein. This vein carries oxygenated blood back to the heart, from the lungs. The role of the artery is to carry oxygenated blood away from the heart to the tissue, whereas the role of veins is to carry deoxygenated blood from the body to the heart again. In both the cases, the exception is pulmonary artery and vein, as the pulmonary artery carries the deoxygenated blood and the pulmonary vein carries oxygenated blood. Arteries are red, as they carry oxygenated blood, but the veins carry deoxygenated blood, and so they are blue. Arteries are positioned deep within the body, while veins are present close to the skin, in the body. The other features of the arteries include the lumen which is narrow; the wall is thick and elastic, even the muscle layer is thick to support the high pressure of blood, although valves are absent, the externa tunica layer is less strong and not well developed, the media tunica are thicker. In case of veins, the lumen is broad, the wall is thin and less elastic, even the muscle tissue layer is thin, and valves are present in them, which provides the unidirectional flow of the blood. The externa tunica layer is more strong and developed, but the media tunica is thin and less muscular. 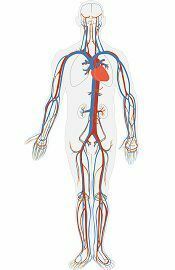 Arteries amount around 30% of the total blood which is low in comparison to the vein, which amounts approximately 65% of the total blood volume and rests 5% is the capillaries. The flow of blood in the artery is under high pressure, and in veins, the flow is with low pressure. It is noticed that at the time of death the arteries get empty and the veins get filled. Types of arteries are the pulmonary and systemic artery, and types of veins are superficial veins, deep veins, pulmonary veins and systemic veins. The two main disease which affects the artery is Atherosclerosis, and Myocardial ischemia and the disease that affect the vein is Deep vein thrmobosis. Even the pulse rate is detectable in arteries, which is undetectable in veins. Arteries and Veins are the blood vessels in the circulatory system of the body. Both are the layer of muscles (muscular tissue), which are responsible for expansion and contraction of blood vessels. Both are the carriers of blood. These are composed of three layers called as Tunica (externa, media, interna). Arteries and Veins, both are the part of body’s circulatory system, subjected to carry blood in the body. They both play the significant role in the body. Being the part of one organ, both differ in their functions, but the complication in anyone may cause a problem to the whole body. Hence it gets mandatory for the person to consult health care professionals if they feel any such problem.